1 Happy Birthday Bookmark. These are a useful essential for any groups of young children - from Sunday Schools to Brownie groups and schools. They are a simple but special gift to celebrate birthdays throughout the year. 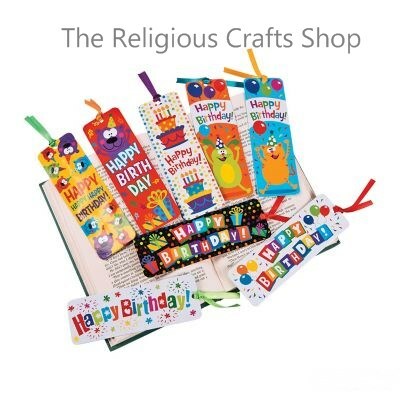 Bookmarks come in a variety of colourful designs so children can choose. Each bookmark measures 15cm by 5cm and is made of glossy card, finished with a coloured ribbon.